The full text of this story is not currently available online. They say every girl remembers that special day when everything starts to change…. “Don’t you want to hear what the big news is?” said Dad. My mother turned her back on us to the cutting board, where she was chopping a fresh salad. In a small voice I said, “Yes.” I tried to smile, but that feeling was in my stomach, made more fluttery by drink. I recognize the feeling now as a kind of knowledge. 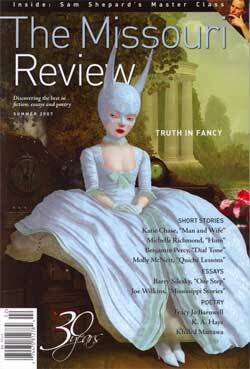 30.2 (Summer 2007): "Truth in Fancy"
Featuring work by Tracy Jo Barnwell, Katie Chase, Douglas Delaney, K.A. Hays, Elizabeth Kirschner, Khaled Mattawa, Molly McNett, Benjamin Percy, Michelle Richmond, Barry Silesky, Joe Wilkins, and Z. Vance Wilson, … and an interview with Sam Shephard.